Lobsters aren't the only animals to come up in the traps. Here a hermit crab is found amid a pile of snails, welks, crabs, and the like. This is a pair of 'Sea Ravens' (they have many other names as well). They come in a wide variety of colors (including bright yellow) and eat small lobster. They are frequently found in traps. Their population has been growing rapidly over the last few years due to the decimation of the ground fish populations which account for some of its predators. Sometimes you can feel small lobsters in their stomachs. Wolffish - This guy gets his own page. Click here to	check it out. 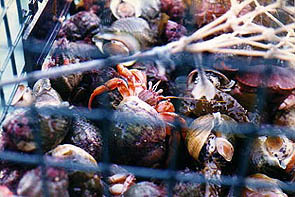 Hermit crabs are frequently found in traps. Some can be quite large compared to the ones usually found on the beach at low tide. This is a crab (on its back) that wandered into a trap. 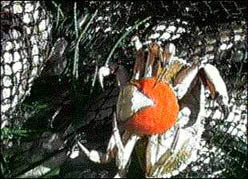 What appears to be an orange tennis ball under its apron (tail) is actually a mass of eggs. 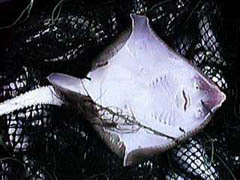 This is a skate (lying on its back). The wings of the larger ones are good eating. 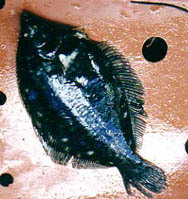 A flounder. 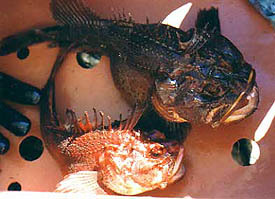 Cod and flounder are regulated species and may not be taken with a lobster trap. This is a 'Dog Fish', a small shark. Just in front of each dorsal fin is a short sharp spike. Handle with care. 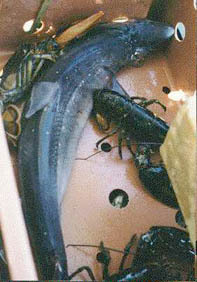 These animals will chew through the netting in the traps and bait bags. Although relatively small, they school in numbers great enough to be detected on a depthfinder. Another dinner guest. This is a 'Cusk'. You see Cusk being sold more and more in markets as the ground fish populations decline.